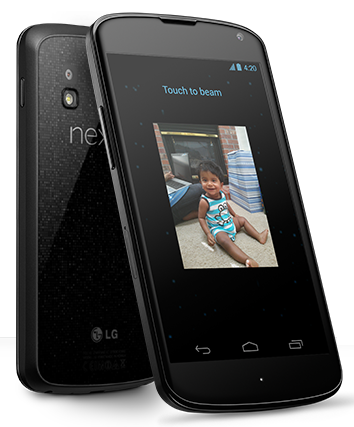 Nexus 4 is the new smartphone from Google Made in partnership with LG. Nexus 4 comes with cutting edge hardware, the latest version of Android, and the latest Google apps like Gmail, Chrome, Maps and more. And also users can download over 675,000 apps and games from Google Play store. The Nexus 4 is available on Google Play for $299 for the 8 GB model, and $349 for the 16 GB model. Google sales nexus 4 smart phones through Google play store but unfortunately Google Play Store is not available in India. LG will introduce the nexus 4 in India by end of November. However, thanks to ebay online store which is already takes pre-order for Nexus 4 in India. The eBay will be importing Nexus 4 smart phones from Google Play store in the US to sell in India. Nexus 4 handset current price on eBay store as Rs. 23,490 for 8 GB model and Rs. 27,490 for 16 GB model. Delivery starts on eBay from December 10, 2012 and will reach you depend upon your living area.